The Jungheinrich AM G20 hand pallet truck is the perfect solution for outdoor operation and in particular humid environments. A zinc coating provides the truck’s steel components with a reliable protection against corrosion. The main application areas include wholesale markets and fruit growing operations. High level of corrosion protection offered by surface hot dip galvanisation. 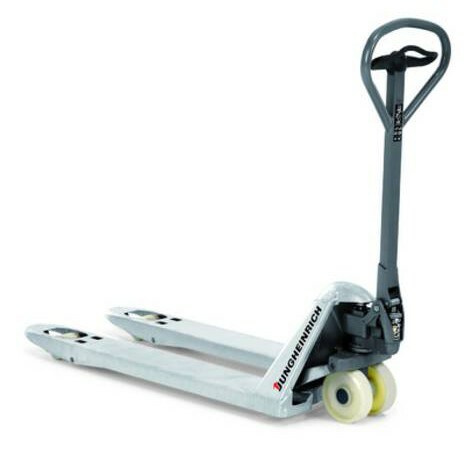 The chassis length of 373 mm allows the truck to be used safely and easily in confined areas. The further optimised hydraulic system reduces the pumping action required. The bushes on the wheels reduce the required drawbar pull. The chromed bushes on the wheels and joints ensure quiet running and an exceptionally long service life. Joints no longer require lubrication; the AM G20 still runs smoothly. Markings on the truck show the exact pallet position required for crossways lifting. 2000 kg capacity for the basic model. The AM G20 can be equipped for any application thanks to a extensive range of optional equipment. This includes a range of fork lengths, various widths, wheel combinations and brake systems.